Options: Jumbo 96 oz. Large 48 oz. Medium 20 oz. 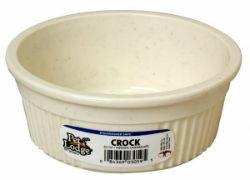 Crock-style pet dishes feature chew-resistant walls and rims. Exterior detailing adds an element of style to this popular item. Made of impact-resistant plastic that is dishwasher safe.